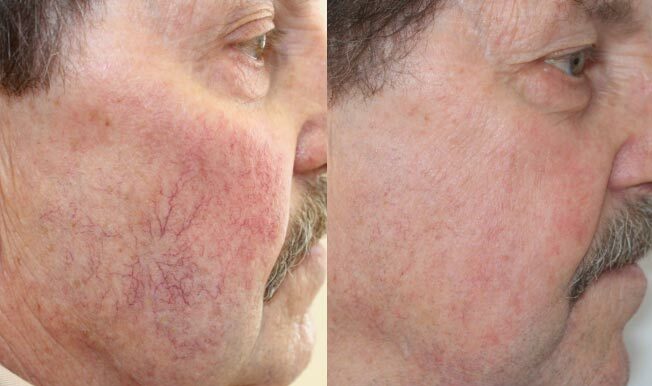 Spider veins are small unsightly red or purple vessels on the surface of the face and legs .They are often red or blue and are closer to the surface of the skin than varicose veins. They can look like tree branches or spider webs with their short jagged lines. They can cover either a very small or very large area . Varicose veins and spider veins are often painless and do not usually cause health problems. There are two main causes of varicose veins: age and pregnancy. Due to the aging process, many bodily tissues lose flexibility over time, including the veins in your legs and feet. These veins are continually working to return blood to your heart. Since they are working against gravity, blood can start to pool and give the veins a raised, knotty appearance. These are known as varicose veins. Since they are working against gravity, blood can start to pool and give the veins a raised, knotty appearance. These are known as varicose veins. During pregnancy, the total volume of blood in your body is increased while the blood flow from your legs to your pelvis decreases. More blood is diverted to support the growing foetus. However, this and the weight of the uterus pushing down on the legs may result in varicose veins. 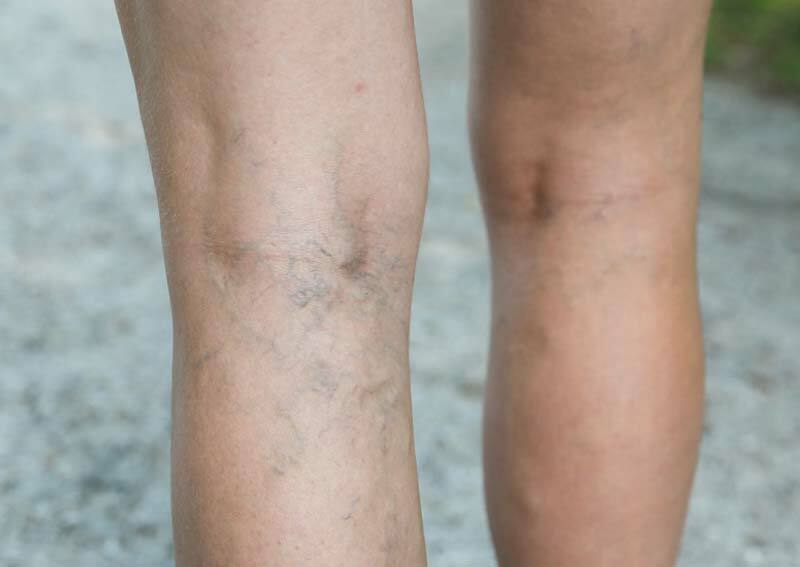 This is why varicose veins are more common in women than men. Though the majority of cases are not painful, varicose veins are aesthetically undesirable. Fortunately, Atlantic Dermatology and Laser offers several options for treating them. WHAT ARE SOME COMMON TREATMENTS FOR VARICOSE VEINS? Treatments offered at Atlantic Dermatology and laser include self-care and laser treatments. Self-care: Varicose veins can be eased by maintaining an active lifestyle with plenty of exercise. Improving your muscle tone and circulation helps move blood more easily throughout your body. Other tips include avoiding tight clothes that can squeeze your veins and cause them to pop up, elevating your legs when possible to encourage blood flow from the legs to the heart, and alternating frequently between standing and sitting. Laser treatment: Using laser technology can achieve the same effect as sclerotherapy, but without requiring invasive injections. Carefully modulated laser pulses target the blood flow beneath your skin, dissolving veins over a series of sessions. The causes of spider veins on the legs and face include prolonged exposure to the sun, circulation problems, increasing age, trauma, medical conditions and certain habits such as smoking or alcohol. Women tend to be affected by spider veins 2-4 times more commonly than men do, due to the fact that female hormones and pregnancies are so commonly implicated in their cause. Laser spider vein removal and laser varicose vein removal allow individuals with unsightly and unwanted veins to have them removed safely, quickly, and effectively. Both laser vein removal procedures are minimally invasive and are performed while the patient is conscious. Because lasers are so precise, there is little to no risk of burns or blisters on the skin. In laser spider vein removal, light passes through the skin and sends pulses of energy to the targeted vein without harming the surrounding tissue. As the blood absorbs the light, it heats up and causes the targeted vein to shrink, eventually resulting in its disappearance. Laser spider vein removal requires no injections and no incisions. Generally, patients only experience a minimal amount of heat. Treatment time is about 20 minutes but may be longer or shorter depending on the severity of the veins and the size of the affected area. For optimal results, several laser spider vein removal sessions may be necessary. Atlantic Dermatology and laser has invested in the leading and latest technology to ensure you get the best results possible. By integrating the latest cutting-edge lasers and skin devices into our treatments enables us to be ahead of the curve in so many ways and the results we are achieving for our patients really do speak for themselves. After your first consultation with skin and Laser specialist Cherie Cochrane, you will leave here educated and a with a plan of how to look after your skin from the inside out.